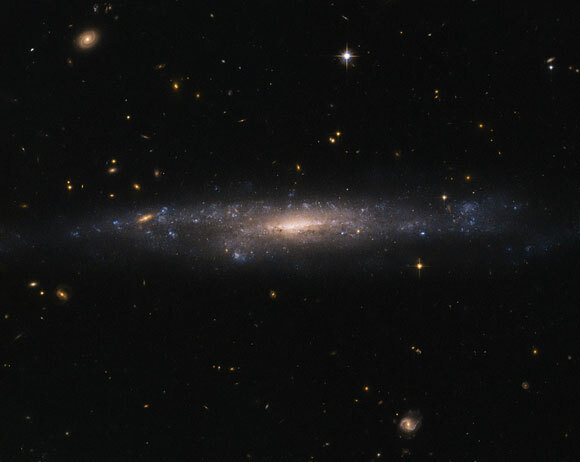 This newly released Hubble image shows galaxy UGC 477, which is located just over 110 million light-years away in the constellation of Pisces (The Fish). UGC 477 is a low surface brightness (LSB) galaxy. First proposed in 1976 by Mike Disney, the existence of LSB galaxies was confirmed only in 1986 with the discovery of Malin 1. LSB galaxies like UGC 477 are more diffusely distributed than galaxies such as Andromeda and the Milky Way. With surface brightnesses up to 250 times fainter than the night sky, these galaxies can be incredibly difficult to detect. Most of the matter present in LSB galaxies is in the form of hydrogen gas, rather than stars. Unlike the bulges of normal spiral galaxies, the centers of LSB galaxies do not contain large numbers of stars. Astronomers suspect that this is because LSB galaxies are mainly found in regions devoid of other galaxies, and have therefore experienced fewer galactic interactions and mergers capable of triggering high rates of star formation. LSB galaxies such as UGC 477 instead appear to be dominated by dark matter, making them excellent objects to study to further our understanding of this elusive substance. However, due to an underrepresentation in galactic surveys — caused by their characteristic low brightness — their importance has only been realized relatively recently. Be the first to comment on "Hubble Views Galaxy UGC 477"